Carpets are a long-term investment. As such, they need to be taken good care of. While regular vacuum cleaning may remove dirt and dust from the carpet, professional deep cleaning is essential to remove allergens and dust mites as well as to flush out tough stains caused by spills and foot traffic. American Cleaning & Restoration has a reputation for being one of the best carpet cleaning companies in the area! Heavy traffic areas? Pet stains? No problem! Our truck-mounted carpet cleaning unit utilizes the latest technology to completely remove dirt and grime from your carpets. American Cleaning & Restoration uses the only professional deep carpet cleaning method recognized by carpet manufacturers to clean your carpet fibers. Most carpet warranties require this method. Each of our trained & certified technicians abide by all major carpet manufacturers’ recommendations and warranty requirements, including those for stain-resistant materials. It’s important that you know the difference between your carpet manufacturer’s cleaning recommendation and the various methods currently being offered by other companies. Many “chemical clean” processes do little more than drive dirt down into the carpet and damage fibers. At American Cleaning & Restoration, we will inspect your carpet and determine the best and safest way to clean, freshen, and renew your floor coverings. If you’re looking for a carpet cleaning company, American Cleaning & Restoration is the company to choose. We also offer deodorizer services as well as ScotchGard® stain resistant treatment! Contact us today for a free carpet cleaning quote! Dust mites are microbes that live within the carpet and typically depend on a diet of dead human skin cells. You’ll know that there are dust mites within your home or office if you experience a lot of itching and sneezing. If left unchecked, they can cause asthma and allergies. Carpets and rugs can also be attacked by mold and mildew if there is poor air circulation. These microorganisms can make your family or staff sick with illnesses such as asthma, allergies, and rhinitis to name just a few. Regular, professional carpet cleaning can minimize or completely eliminate these problems. If you’ve ever experienced fishy or locker room types of odors, that’s another reason you need to regularly deep-clean your carpets. Owing to poor air circulation, bacteria, mold and mildew can attack the carpet resulting in strange odors that can cause embarrassment when visitors come to your home or office. While air fresheners can help “cover up” the unpleasant odors, they are rarely the solution. In order to kill the smell, you need to address the actual cause. Expert carpet cleaning is the best way to remove microbes within the carpet that might be causing those unpleasant smells. The most obvious benefit of carpet cleaning is how great your carpets look afterwards. Dirt and dust buildup on the surface of your carpets will, over time, make them appear dingy and grey. A quick remedy for this is steam cleaning where hot water is injected into the carpet to loosen surface stains and dirt for easy removal. Carpets that undergo heavy foot traffic, in particular, should be cleaned regularly. A carpet that undergoes water damage should also be cleaned professionally. With all of the wear and tear we can put on our carpets it’s easy for them to become unmoored at the edges, develop wrinkles, or get damaged. Luckily our team of carpet professionals are ready to handle the job. 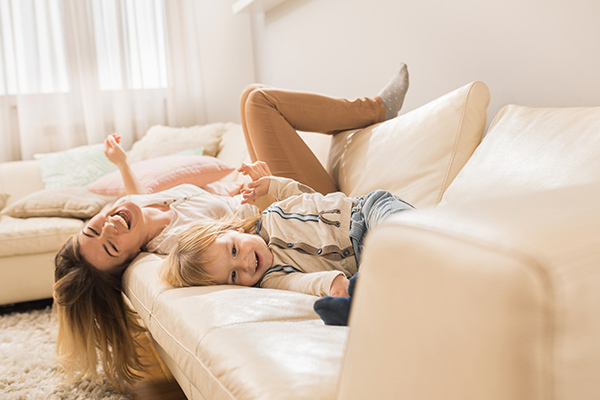 They have the experience and know-how to stretch your carpet back into its original position and set it back in place, eliminating any runs and hazards to you and your family. American Cleaning and Restoration also offers professional upholstery and furniture cleaning. No matter what type of upholstery fabric you have, our expert technicians are specially trained to handle everything from microfiber to silk to cotton and polyester. We begin by carefully inspecting each piece, looking at the construction and fabric type. Then we select the cleaning method that will safely remove dirt, stains, and odors. We treat your furniture with the utmost care, ensuring that it will be left clean, fresh, and looking like new again. We are committed to providing each of our customers with top quality service, technicians, and products. Call us today for a free quote!